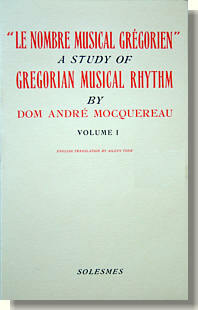 Le Nombre Musical, \a product of the brilliant mind of a French monk\", is and will always remain, a long with Dom Joseph Potier's Mélodies gregoriennes (Gregorian Melodies), one of the great classics of musicology, forever worthy of being re-edited in order to remain available to Gregorian chant scholars. Ever since they were first published, these works have given rise to numerous studies illustrating, how fruitful the intuitions of these pioneers were, while, at the same time, shedding Hghl on some of their limitations. Mrs. Justine B. Ward, as her recent biography by Dom Pierre Combe recalls, went to great lengths in order to assure an English translation of Le Nombre Musical. Thanks to her, the translation of Volume One was published by Desclee in two distinct parts.